In past years, the beavers took down trees around the pond and trail without disturbing much of the shoreline along the condos. However, this fall they began taking down trees that provide privacy along the back of the condos. This concerned some of our new residents, as well as some of our long term residents who were beaver believers. We all agreed that the trees needed to stay, but the beavers didn't need to go. In keeping with our long term efforts to co-exist with our longest standing resident rodents. The board enlisted the help of the building and grounds committee to begin protecting trees with wire, and over a period of three days, about 100 trees were protected. That should provide enough relief for the winter, and come next spring, we can finish protecting trees around the condos. 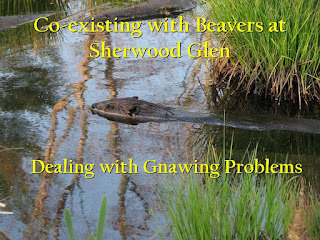 At the same time we were protecting the trees, we wanted to bring our residents up to speed on the benefits the beavers bring to Sherwood Glen and provide them with a bit of history concerning or interactions and conflicts over the past half dozen years. So on December 3, I made a presentation at the clubhouse. I was pleased to see more than two dozen residents in attendance, as well as receiving messages indicating there were folks who wanted to attend, but were unable to do so. In order to provide information for those folks and others who might want it in the future, here is a multimedia version of that presentation.